We take advice from almost everyone we know– our bosses, our kids, glossy magazines, the doctor, and even the local barista. But most of us ignore our most valuable source of wisdom: our bodies. When life gets hectic, we seldom consider that our pain is a signal to pay closer attention; we neglect the mind body connection. Our bodies respond to stress in many ways. Physical discomfort can happen as a result of any number of external causes, but it’s important to remember that your body, your mind, and your emotions are intricately and inextricably connected. Emotions play a critical role in your physical health, so if you find yourself experiencing frequent headaches, insomnia, or foot soreness, take a moment to get curious about your symptoms. Do you have too much on your mind? Are you waking up worried or anxious lately? Are your feet sore? It’s possible that a deeper emotional issue is contributing to your discomfort. Let’s start with something simple: if you’ve noticed discomfort in your feet– swelling, cramping or constantly curled toes– your shoes may be only part of the problem. If you’re a chronic toe-curler, then it may be time to evaluate your apprehension about the future. If you have flat feet try taking a closer look at the areas of your life where emotional boundaries would be beneficial to your wellbeing. The symbiotic relationship between physical symptoms and emotional symptoms is not an arbitrary one. 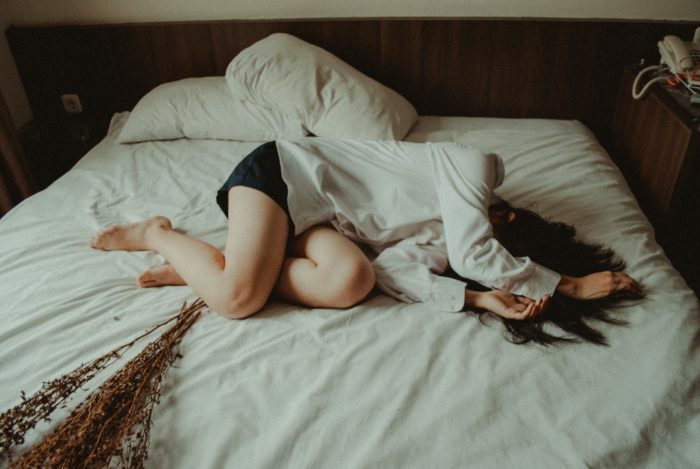 Have you ever met someone who’s felt trapped in a dissatisfying situation or relationship, and simultaneously suffers from fatigue, exhaustion, or depression? Therein lies a perfect example of the mind/body connection. If the stressful situation is left unaddressed, serious medical issues can develop. There’s good news, though. You don’t have to pick sides when it comes to your healing journey. It often takes a gentle, all-angles approach to alleviate chronic pain. For instance, in addition to managing the physical discomfort with anti-inflammatory (AF) medications, AF foods, and AF exercises (yoga perhaps), you might integrate mindfulness tools to speed up recovery. Tools such as meditation, visualization, therapy, and coaching have all been proven to magnify the healing effects of traditional medicine. Significant healing can only occur when the sufferer consciously combines emotional awareness with physical treatments. To learn more about yoga therapy for healing chronic pain, visit KristalFiorentino.com. Previous PostLiving with Anxiety? You Are WAY More Normal Than You Think.